People are really up to something that would make their life easier as they always invent or come up with things that can perform multi-tasking just like when you're working in an office and doing the job of two or more employees. Well when it comes to gadgets I find it so cool because it doesn't just saves space, time but saves you money also for having multi-functional gadgets. 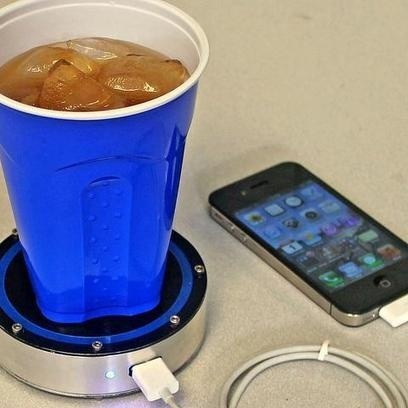 Just seeing this coaster that can hold an icy drink while charging a phone is one great example of what I'm saying. Imagine yourself enjoying a cup of drinks while having your mobile phone charge at the same time. I find it very entertaining but there's a small disadvantage perhaps because if I have my precious current model of smart phone I wouldn't let it sit side by side by a cup of any drinks because it poses a risk of my phone getting wet if someone accidentally push or mishandle the cup. That would be so disastrous. So for me little innovations are great and really cool but we also have to think of the consequences of modern gadgets. I love modern gadgets and innovations for that matter but if it will affect certain important things. I guess I will be contented over my own gadgets be it single-functioning accessories or multifunction ones.